Presenting the ultimate action figure portrayal of the Clown Prince of Crime, comes Suicide Squad The Joker SH Figuarts Action Figure! From the film Suicide Squad, this fully articulated figure is detailed down to the seams and wrinkles in his clothes! The figure is colored using digital coloring technology so meticulous that it's even able to capture the distinctive color of his pupils. 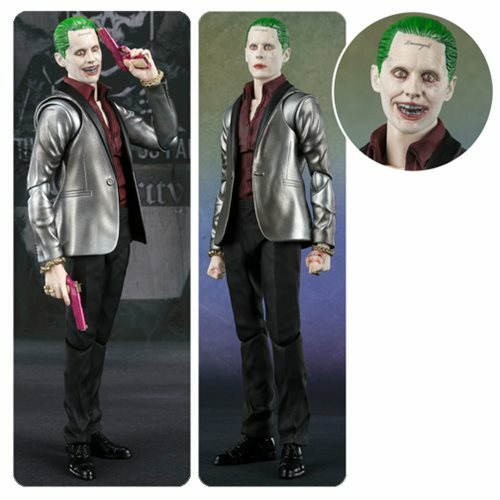 Approximately 6-Inches tall, the Suicide Squad The Joker SH Figuarts Action Figure comes with two heads with different expressions, two types each of left and right hands, and the Joker's trademark pink pistols. Ages 15 and up.